Let’s take a look at some of the most popular bedroom layout ideas. Space planning is the first priority of professional designers. The $500 ultra-luxe duvet will not matter if your space is poorly planned. 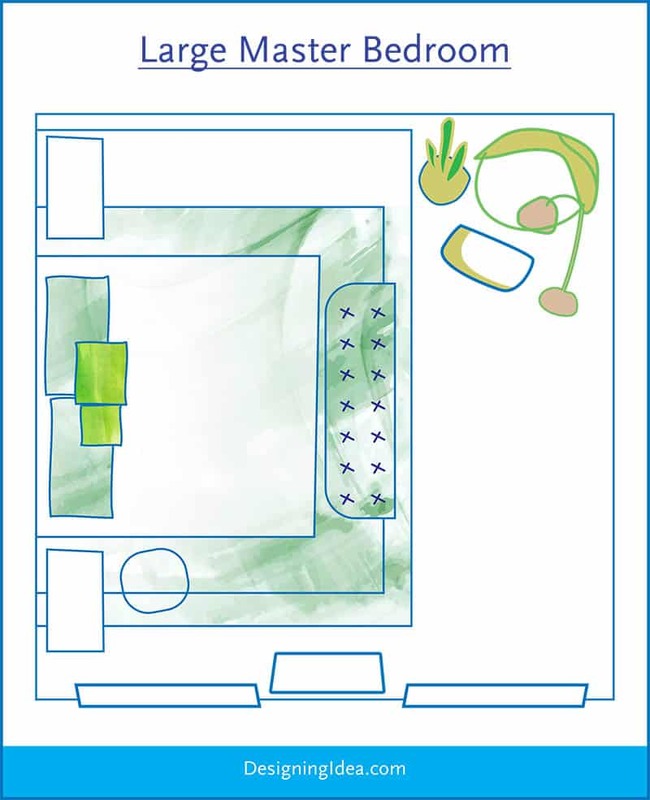 The layout, or space planning, of your bedroom is the most important aspect of your design. It will dictate how traffic flows through your space and can showcase your design aesthetic in the most pleasing way possible. 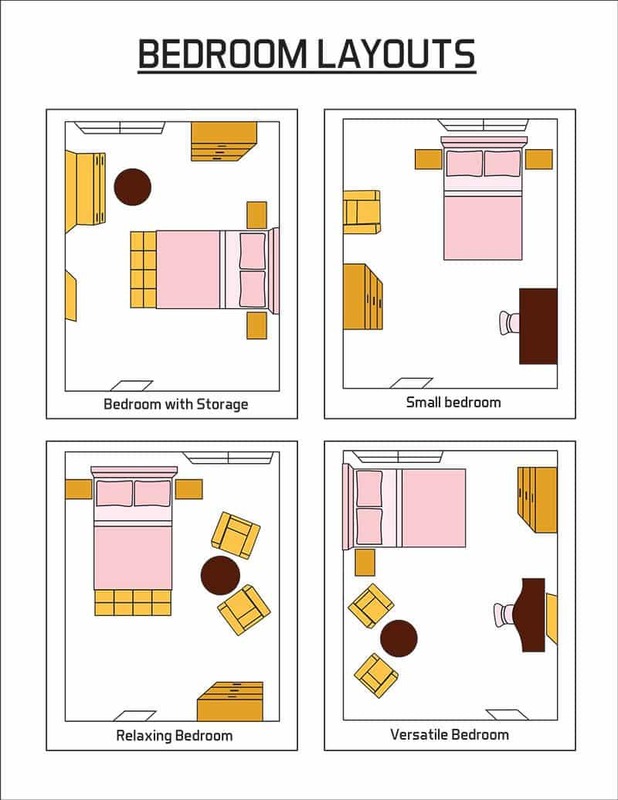 Below are a variety of bedroom furniture layouts to help you maximize your space and create a great looking design you’ll love. Whether your space is big or small, the right layout can make all the difference in how you see and use your space. Most bedrooms are designed to have a “bed wall” but that doesn’t mean that is the only placement for your bed, with a little bit of creativity and some design rules, you can take matters into your own hands and create the bedroom layout of your dreams. Regardless of your bedroom size, you want to keep your traffic areas open, maximize your view, let in plenty of natural light and ventilation, and maintain your privacy. 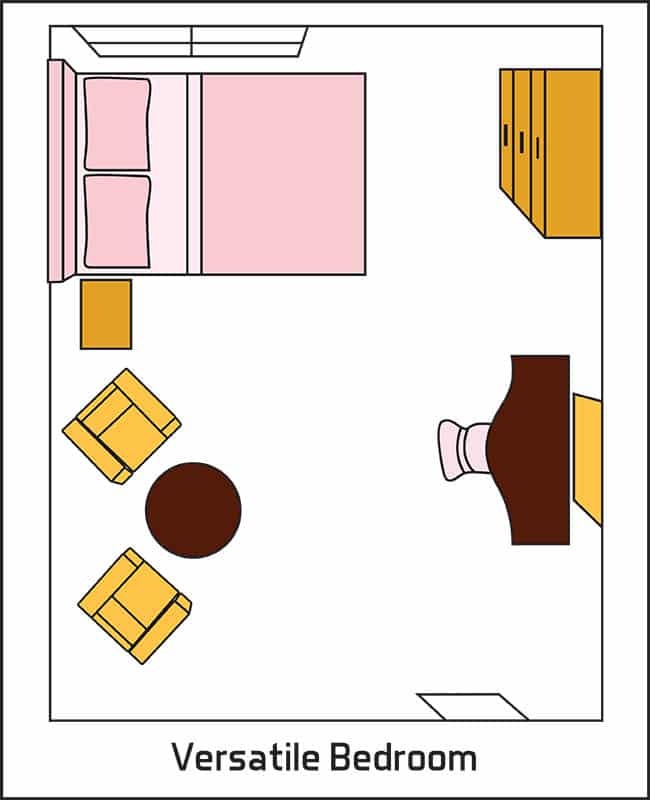 Pro tip: make a little floor plan for yourself, do a quick scale drawing of your space, make a separate drawing of your furniture and cut the furniture drawings out. 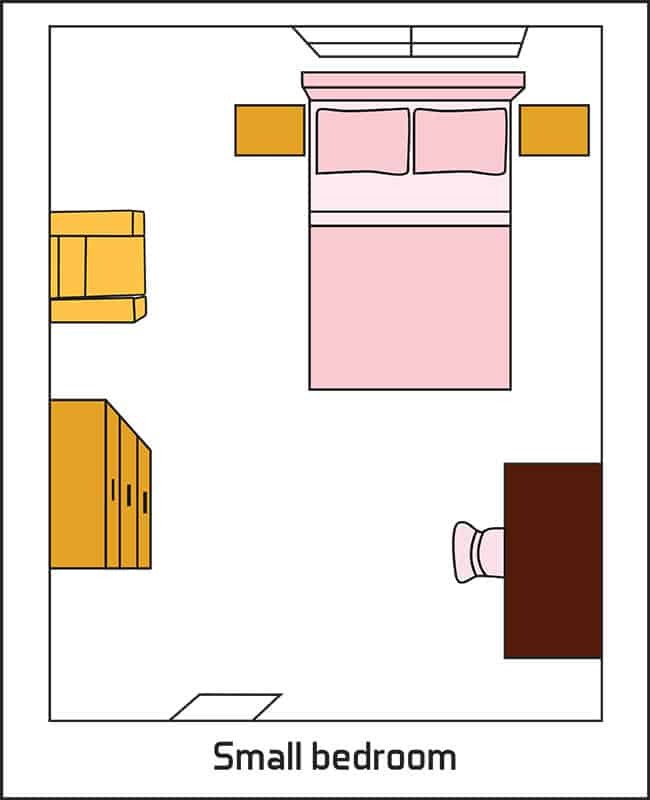 Now you can play with the arrangement by moving the furniture around the drawing of your room. Placing your bed in the center of the wall and flanking it with bedside tables is traditional and works in most spaces, but it isn’t the only way! On the side closest to the wall, opt out of a table altogether and choose an invisible wall-mounted bookshelf and stack your favorite bedtime reading in a unique column of book art. On the other side, place your bedside table or even a small sofa table that could double as a vanity top. Bring it all together with an area rug that stretches nearly wall to wall. The sky is the limit when you have a master suite. Sometimes those large, empty spaces can be intimidating, especially if you don’t have the furniture to fill them! But fear not, intrepid designers, we have you covered! If your master suite comes with a large closet, take advantage of it by installing a closet organization system that will hold all of your clothing and accessories. This will free up room in your cavernous suite for a relaxing retreat without the clutter of everyday necessities. Go ahead and get that luxurious king-sized bed, whether it is a minimalist platform or a four-poster solid wood antique, you have the room to live large! Place the bed right in the center of your bed wall, flank it with bedside tables that match in scale but mix up the shape, make it interesting, make it yours. Because of your amazing closet organization, you don’t need a dresser in your space. Think about how you would like to use your extra space. Perhaps you want a meditation area in the corner or a quiet place to read or knit. Because you have the space and you already have our bed placement, you can really get creative with how to utilize the rest of your bedroom. Create a nice conversation area in your master suite. Place two beautiful upholstered chairs or one fantastic lounge chair, an occasional table, a woven jute basket to hold an extra blanket or two in the corner of your room, and you have a restful, relaxing retreat right in your own master suite. If you love coffee like I do, consider have a sleek mid-century credenza modified to hide a mini-fridge and your favorite coffee maker. There will be plenty of room for a few coffee mugs and spoons and no one will be the wiser! The top would make the perfect landing spot for a couple of tall lamps and that delicate tabletop sculpture you had to remove from the living room when you had kids! Place a large, framed mirror on the wall behind it to increase the natural light that comes into your space. This can be placed across from your bed or on a wall next to your bed so you only need to stumble a few feet before you can say coffee, coffee, joy, joy. Don’t let anyone tell you that size matters in the bedroom, they are totally wrong! You can have a sophisticated, stylish, beautifully designed room if you have the right layout! Well, maybe bed size matters, you are not going to create anything but a mess if you insist on a king-sized bed in postage stamp room. A place for everything and everything in its place, as the saying goes, makes for great design. Maximize storage in a small room by adding built-in shelving on the wall that your bed will go on, using drawers at the base on either side of your bed. Include wall-mounted lighting on either side of the bed, add artwork in the space above, and you have stylish storage and free your floor space up by decreasing the need for separate dressers. This not only puts everything that you use on one side of the room, making efficient use of circulation, it also makes your room appear larger, and gives it a more open, airy feel. For a small guest bedroom layout rather than shove the bed against one wall to give the illusion of more space try to leave an aisle to either side of the bed which will improve the flow of the room. Not only will guests be able to get in to the bed easier, it will also allow room for nightstands on both sides. Another small bedroom layout tip is to use only one major furniture piece per wall. This will help the space not feel too cramped. Additionally, think about ways to brighten up the space. Lighter colors are more light reflecting, choose a light and neutral color palette for small rooms. Adding a small mirror can have a big impact in making the room feel larger. For drapery, try installing long white curtains to soften direct sunlight while still keeping things bright. Not only will you create a romantic atmosphere n your small bedroom, it will look inviting and larger in the process. Finally, it may be a good idea to consider a space saving bed for a small room. There are a variety of beds such as murphy beds, day beds, bunk beds, folding beds and pull out beds that can offer you a lot more room to work with. These types also work well for those who want a multi-purpose room such as a part-time office or play room. It’s hip to be square, really, it is! A square bedroom begs to by symmetrical, it also begs for a big, square rug to anchor the furniture. Start with the rug, if your budget is limited, look to natural rugs like jute or seagrass, they are less expensive, incredibly durable, and have a natural glow that brings the outdoors in. Get a rug that will extend to about 6” to 12” from the walls. Start with your bedside table, place it so that it is close to the corner. Then place your bed and other bedside table. Add a chair in the corner with a floor lamp behind it. 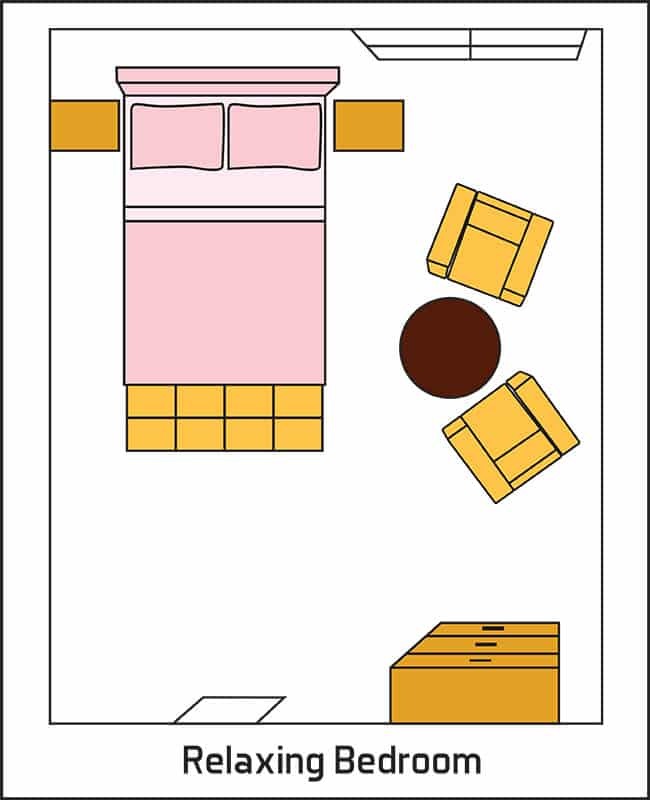 Across from the bed, you can place your dresser and another chair near the corner. The wall with the window should face one side of your bed, letting the natural light and cool breezes spill, uninterrupted, into the room. Bedroom layouts can be tricky because there is so much to consider. But relax, design should be fun, not stressful! Consider how you want to use your space, what needs to go into the space, make a few quick sketches of layout possibilities, and use the tricks of the trade that you have learned today to create bedroom that is functional, beautiful, and personal. There are a variety of bedroom layout ideas for several different room types. 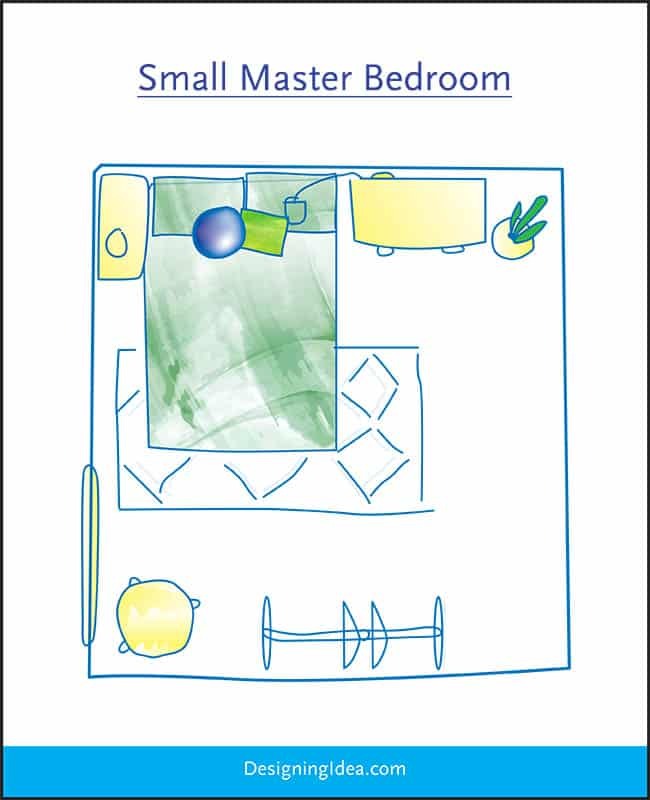 Below you’ll find layouts for a bedroom with storage, small bedroom, relaxing bedroom and versatile bedroom design. A bedroom with storage is ideal for those with a smaller amount of square footage in their home, such as that found in many apartments and condos. A bedroom with storage can be maximized for the purpose by utilizing under bed storage found in many types of platform beds. It is also advisable to have several dressers to provide additional storage opportunities. To achieve a relaxing bedroom layout think about adding a plush bed ottoman or bench to the foot of the bed. Not only will this piece of furniture help you match and accentuate the prints and lines in your bedroom design it can also provide extra storage space or just a place to put on your shoes. Bed benches come in all sorts of styles such as Mid-Century Modern, French Provincial, Chinoiserie, Cottage, or Hollywood Regency. If there is room you can also add some comfortable chairs with a small table to act as a place for your morning coffee, a reading nook in the corner of the room or just a place to socialize with your significant other. If you want to use your bedroom as a multi-functional space a versatile design may be right for you. 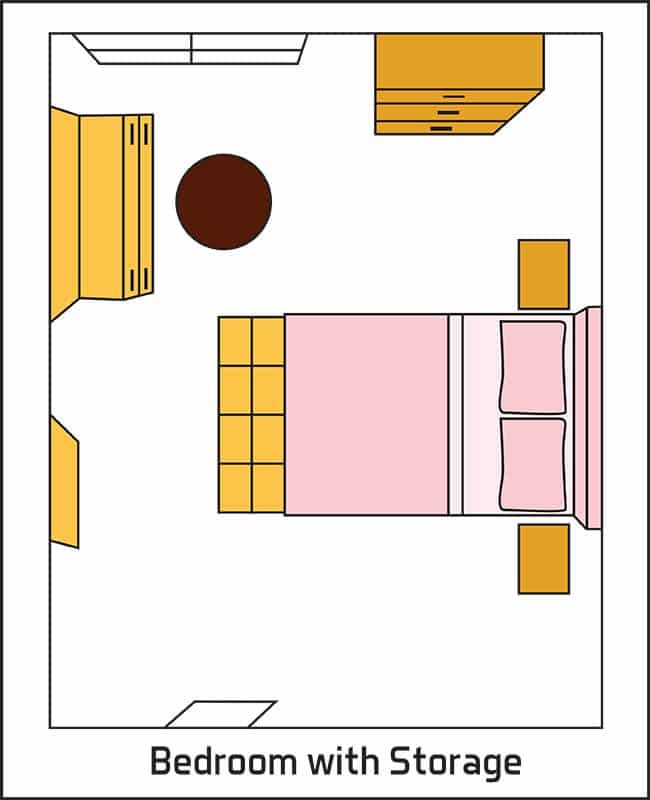 In the image above the bed is positioned against a wall due to a large window which can often prevent the bed from being positioned in the center of the room. A multi-functional bedroom design could be used as an office and a bedroom with a desk set up across from a bed. It may have a seating area with table for relaxing and enjoying coffee, or it could have wall dedicated to a makeup vanity or extra storage cabinets. A versatile bedroom layout is quite similar to a studio apartment design with a room that functions for activities besides just sleeping. 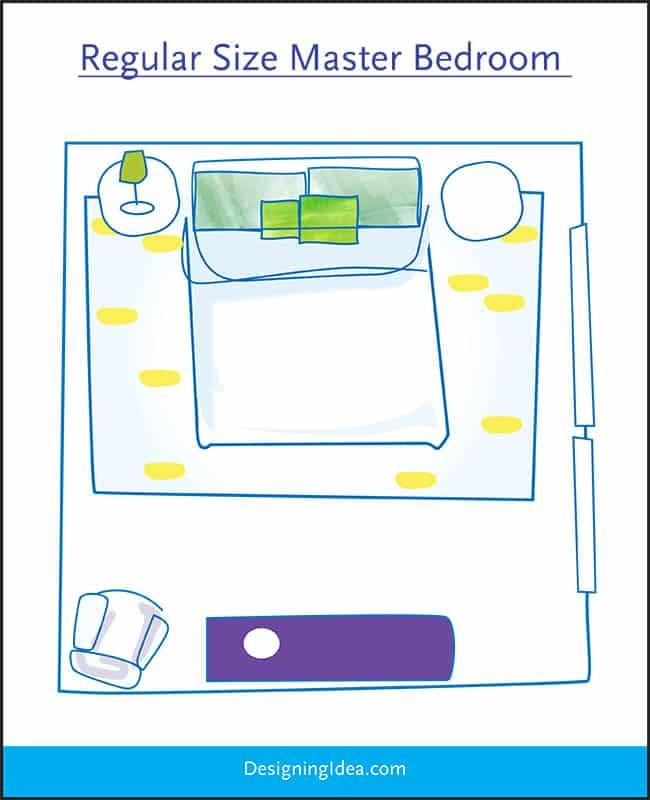 Here’s a helpful illustration of some of the most popular bedroom layout ideas.